Irish immigrants to American during An Gorta Mor may have found much more than they bargained when they were caught up on the battlefields of the American Civil War. Into their new nation’s internecine struggle stepped two Irish soldiers who left Ireland in 1849 with their parents, Thomas Sarsfield and Winifred (nee McGrath) Real, and five siblings. Patrick Sarsfield Real was the elder of the two brothers who found themselves as soldiers in their adopted land. Patrick was born in 1835 near the small southeast County Limerick village of Oola (Ulla). His youngest brother, James Joseph Real, was born in 1842. When the two boys boarded the ship John O’Toole sailing from Dublin in 1849 neither had any inkling of the future that waited them. Although the family would eventually settle in Illinois after arriving in New Orleans, young James was left in Memphis, Tennessee. Much like the ancient Gaelic custom of fostering, James would be apprenticed to a cousin. Over the years, the Reals in Illinois prospered and James grew to adulthood with his new friends in Memphis. In the spring of 1861, with the American nation quickly racing toward a national catastrophe as Southern slave-states moved to leave the Union after the election of Abraham Lincoln, Patrick Sarsfield Real was sent to Memphis to return home with his younger brother. That was not to be. As the two brothers discussed the coming war, James argued like most state oriented southerners that Tennessee was his home and he was expected to stand by his home. Failing to convince his brother to leave Memphis, Patrick Sarsfield Real began his trip home. Within days of their conversation, James Real enlisted in the 154th Sr. Tennessee Regiment. Older brother Patrick, stopping off in St. Louis, Missouri on his way home, signed enlistment papers with a loyal state regiment, the 7th Missouri. By the end of the first week in June both brothers stood in uniform on opposite sides of the struggle to either change or preserve the American union. Over a two-day period in early April 1862, the battle field of Shiloh in Tennessee became a precursor to the bloodshed that underscored the horrors of the American Civil War. More American soldiers fell during those two days of battle then had been lost in any American war up to that point. And one of the young soldiers that fell during the battle was a 20-year old Confederate private named James Joseph Real. Real’s death on the battlefield, however, did not pass into obscurity. In July 1862, Thomas Fitzgerald wrote a letter from Memphis to his brother John in Illinois. The letter extolled the virtues of their young cousin. John carried the letter with him when he moved to the growing farm state of Nebraska. In the days that followed the Battle of Shiloh, Patrick Sarsfield Real’s 7th Missouri Regiment arrived at Shiloh and set up their tents near the several mass graves dug to quickly intern the Confederate dead. Here Patrick Sarsfield learned that his brother’s body was forever interred on the battle field. 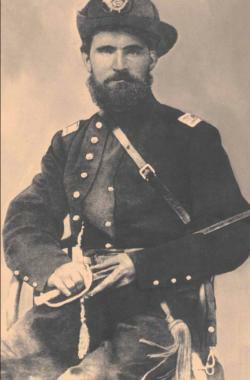 First Sergeant Real deserted from the 7th Missouri and made his way to Memphis to recover his brother’s personal goods. Unable to enter Memphis Patrick carried the news of his brother’s death to the parents and siblings. Within 6 months of his desertion from the 7th Missouri, Patrick Sarsfield Real would again be in uniform. This time, however, with a new regiment from his home state. In September 1862, he entered the rolls of the 90th Illinois Volunteer Regiment. The regiment, also called Chicago’s Irish Legion, was originally formed by the Catholic vicar of Chicago in an attempt to beat back northern accusations that Irishmen could not become good soldiers and that their support of the Union cause was suspect. Quickly rising in rank, the former deserter became first a Lieutenant in Company K. He was later promoted to Captain. Over the next two years, the Irish Legion served in Sherman’s Western Army at places like Vicksburg, Mississippi and Missionary Ridge, Tennessee. Real marched with his regiment as they approached the outskirts of Atlanta and joined in the Union army’s capture of that vital Southern railroad center. When Sherman set out from Atlanta on his famous March to the Sea, Captain Real was left behind. Suffering from dysentery and a gunshot wound, he was too disabled to accompany the rapid traveling army marching to Savannah, Georgia. Real returned to Illinois and mustered out of Union service in the closing weeks of 1864. In 1877, Patrick Sarsfield Real obtained a soldier’s grant of land in the recently formed state of Nebraska. With his wife and children he become a farmer on the rich land that beckoned many Civil War veterans. Within 10 years, his farm had turned into a holding of some 1300 acres. In addition, Real became the owner of a grain elevator, hotel, general store, lumber yard and other businesses in the area. And at the behest of Real many Irish from Illinois found their way to Nebraska, including John Fitzgerald. The success of Real was marked by his building of the first Catholic church in his new hometown of Grafton, Nebraska. After his death in 1893 from war connected disabilities, Patrick Sarsfield Real continued to be remembered. In 1898, a Catholic priest, Edward Murphy, delivered to a meeting of the Nebraska Historical Society a monolog titled: “The Life and Times of P.S. Real.” The monolog would later be published in the Society’s journal. In his presentation, Father Murphy commented on the bravery of Real during the Civil War, on his devotion to his Catholic religion and to his family, as well as his nature of helping those not as fortunate as himself. In 1999, a novel by John Noonan titled 40 Rounds written about Chicago’s Irish Legion during the Civil War used Patrick Real as a central character, only changing his first name from Patrick to Peter. The fictional character of Real dovetailed nicely with the monolog of Father Murphy. And then in 2009, author James Swan published a historical account of the 90th Illinois in the book titled: Chicago’s Irish Legion: The 90th Illinois Volunteers During the Civil War. Several anecdotal stories about Real are noted in the book. 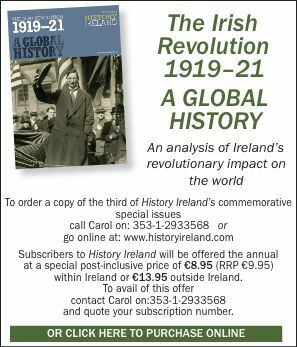 More importantly, it was Captain Patrick Sarsfield Real, the Irish immigrant from Limerick, in full Civil War uniform featured on the cover of the book some 116 years after his death and 160 years after his family left their native Oola, their friends and their nation. Chuck Real is a former insurance company executive now on the adjunct facutly for American History and World Civilizations at METROPOLITAN Community Collge in Omaha, Nebraska. He was a U. S. Marine sergeant and a Vietnam veteran.